Tom Brady’s trendy avocado ice cream can’t hold a candle to my vegan version! Lifted by the citrusy lime and balanced with fresh basil the savory avocado is transformed into sweet creamy deliciousness. My wife would describe my ice cream passion as an addiction or fetish. As evidence, she holds our Paris trip. When asked what I liked most about the trip, I waxed poetically about the ice cream with no mention of the Louvre, Eiffel Tower, or any other monument. Because we travel differently (I’m the one with no plan and figure it out as I go) we agreed that it would be good for our marital health if we took one day and did our own individual thing. My wife designed a day around visits to many of the historical locations including the Palace of Versailles. I just went to Ile Saint Louis where I walked by Notre Dame and spent an entire day eating gelato at places like the world renown Berthillon and smaller up and comers. There were about 6 gelato shops on a block that was no more than a quarter mile long and I sampled them all. They had flavors from both sweet and savory foods like sour cherries, pistachio, and olive. I had eaten so much, my sugar turned bad as the old folks used to say. I could literally feel the sugar-saturated blood crawl through my veins and swelling my extremities. As I walked my toes tingled so I drank water and walked the neighborhood with a grin proud of my man vs. ice cream win. My love for ice cream goes back to my younger days. I grew up under the impression there were only four ice cream flavors – strawberry, vanilla, chocolate, and buttered pecan. Later when I switched schools and began spending more time on Dallas’ northside I got exposed to a whole new world. I spent a lot of time at my classmate and good friend, Luke’s house. His mother always offered me ice cream after dinner and it was different sorbets and fancy flavors like Dulche de leche and Amaretto. I would return home and try to explain the flavors to my grandmother. She, in turn, would take me to our local grocery store and best we could find was rainbow sherbert and Neopolitan. These would have to suffice as my brother and I took a bus trip to a boutique market cross town and it was like $5 a pint. I remember my grandfather being amused by all of this, but then taking half-ripe plums from our neighbor’s tree and condensed milk to make old-school homemade. He would use other fruits like cantaloupe and peaches over the years. Most importantly he planted the seed in me and I’ve been on a quest ever since bearing a love for ice cream with no limits on base ingredients and flavors. The mo odd the mo betta as you’ve probably gathered from earlier ice cream recipes including the blackberry papaya sorbet, dark chocolate sorbet with spicy gochujang, and dragonfruit with fig ice cream. This avocado ice cream recipe was born out of my childhood experiences. I’ve experimented it over the years but recently settled on this version which includes fresh basil and lime juice. 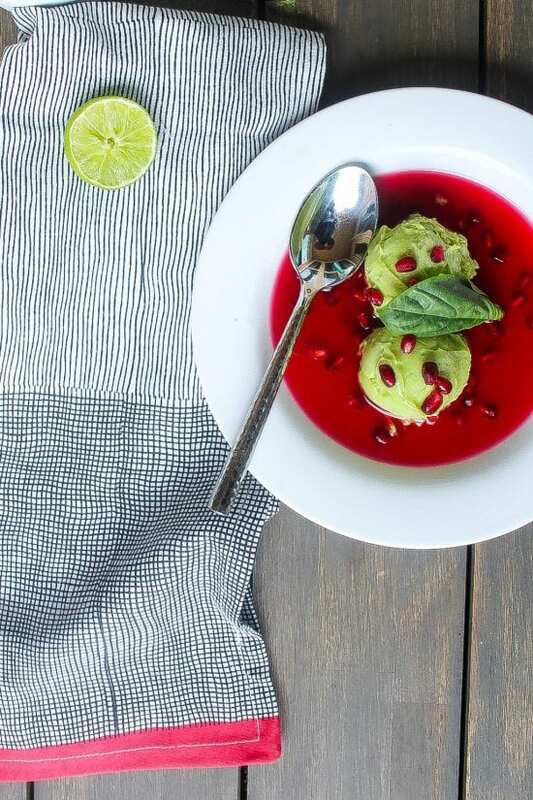 On the surface, one may think avocado doesn’t belong in ice cream, but all the ingredients including the coconut milk and avocado all play well together with no one ingredient overpowering the other while the avocado’s color and the muted buttery flavor. I added a pomegranate-based sauce as well as pomegranate seeds. Both are optional but provide a nice tart flavor and textural contrast to the creamy smooth avocado ice cream. I call it a sauce, but it’s really more of a broth in terms of consistency. 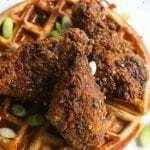 Besides the exceptional flavor and texture, this recipe is super simple requiring only a few ingredients that are all blended together at the same time. I like my ice cream somewhat on the soft side so I dive straight in after the ice cream maker does its magic. If you prefer a firmer texture feel free to place in the freezer for as long as you prefer. Dope beats, fresh eats. Enjoy this delicious, dairy-free basil avocado ice cream recipe! 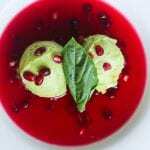 Recipe for creamy vegan avocado ice cream. Basil gives it an contrasting herbal note to the sweetness while the lime provides a citrusy lift. Slice open the avocados, remove the pits, and scoop out the flesh. Put the avocados in a blender of food processor. Add the sugar, coconut cream, lime juice, basil, and salt. Blend until smooth. Freeze in your ice cream maker according to manufacturer’s instructions. If you like soft ice cream, go ahead and eat. If you like firmer ice cream, store in the freezer for a couple of hours before serving. For a firmer version place finished ice cream in freezer.